TRIVO is, against all odds, a street crew from New Jersey. Jersey has some rad rural-urban/east coast crispy spots for sure. These guys are still young but they are well on their way. Feeble 3 downside over the stairs was super sick. When I first saw Fabian in an edit, I told him he should definitely make an all street edit in the future. Fabian listened to that advice, and he recently finished that edit. I love his style, keeping his tricks simple, but landing everything clean. Really digging this, check it out. The Endless Summer Comp is right around the corner. 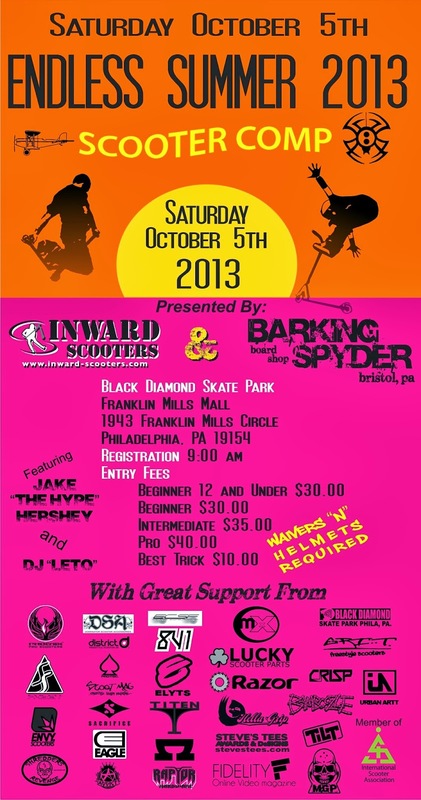 Good luck to everyone that is going to be riding. For more information just check out the flyer below. The AO/Elyts guys keep it coming, this time with a park video. Elliot Arnold is just killing it now. Front board the down, hop over the flat, to front board the 2nd stage to heel...just wat. Guy needs to slow down. This video makes me wanna go ride asap. Let's see.. a year ago Tyler couldn't even walk, let alone ride a scooter. Fast forward to now, and T Bone is back and better than ever. He's picked up a ton of new tricks, and the tricks that people thought he lost, well he has em back too. I've known Tyler since he was a little kid just trying to hang with the big dogs of the NW, and to see how far he's come is so sick. Sit back and enjoy his 2013 Web Edit. Stan, Tyler, and Cary took a trip out to Bend, Oregon back when Tyler was injured to a competition and to film. This is the footy they got. It's always sick to see footy of Stan and Cary. Cary shreds that dirt scooter. This is a video of the classic French style, including members of the Monkez Prod crew- Cedrick Lachot, Sinan Al Faour, Lyes Hamroun, and Nicolas "Mikie" Kittirath. Also included are friends from La Brioche- Ben Tabourot, Paul DeGreslan, Baptiste DeLumeau, and Nicolas Oberlaender. This 12 minute long video features textbook street tech lines as well as some really huge tricks (possibly the biggest wallrides and handrails I've ever seen done, as well as attempts at an enormous barspin and fingerwhip). Grab a snack and settle in to watch this one. Michele is an up and comer from the streets of New York, and represents Gryndo. This kid has a fresh style, and is really good at front boards. Front board down heel like nothin. Also that slider at 2:25...could it be any better? Some of the Elyts boys took a trip up to LA to shred for a weekend along with homie Matt McKeen and test their new "Ruckus" shoe (which actually looks dope). Matt's alley oop 360 over the rail was so sick. Elliot also killed it as he does in every edit, did not expect that hard 3 whip. Super cool edit. This is probably the best commercial for a scooter part I've ever seen. I'd love to see more of these types of videos/ads from scooter companies. Too funny. Kevin from Dissidence hooked it up with this video, featuring some of the guys from Flavor hitting up some spots in Eastern Europe. The few park clips in the video were good, but the street clips definitely outshined them. And at the end, that fat 180? Damn. The night before the Chicago Street Jam, Tilt invited a lot of homies to come sesh the box and rail at the shop. Guys like Matt McKeen, Logan Fuller, Kevin Austin, and more were there to shred, eat some bbq, and have some good times. I can personally say that it was really awesome, big props to Collin and Tilt for putting this on for everyone. I don't know what's up with NW kids being freakisly good at handrails these days. Something is definitely in the water. Bayley used to be another one of those kids at the park but as you can see, he's expanded his riding to include gnarly rails and street setups as well. Front feeble 180 full cab bar was one of my favorite clips. 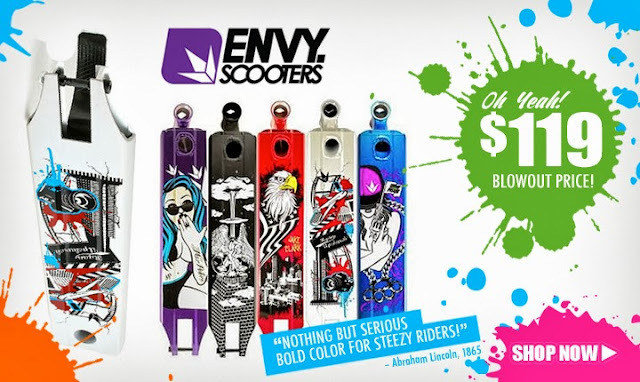 Want to shred on the same decks that the Envy Team ride? Well you can get your hands on them now at The Vault for a sale price of only 119.00. Head over there now by clicking the link below and check em out. Travis House has been in Portland for a while now and got this footage while Hep Greg was in town, along with KC Corning for TSI, which has a new website. There are some additional clips from Travis' native St. John's, Canada. These guys all shred with such unique styles. Super chill footage. Jeremy Malott is known to some as the world's only hope to beating Kota in competition. In this mini-documentary, he takes us through how he started riding, progression, X-Games, and more, while showing some riding clips as well. Music choice is a little questionable but overall it was a well done video. Lucky street heads Jared Jacobs and Kenny Griffin, along with their friend Dylan Marz put down some solid clips in this little edit. Can't wait to see these guys back in the streets. Damion Black on the filming and editing. T-Brad is the man. Plucked out of the sea of Northwest scooter kids, he was groomed by Tomk to become the street beast that he is today. Tyler is a master of rails, especially back lips, and that's why I put him on the cover of Zenith. I'm stoked that he's been picked up and I'm sure Flavor will treat him well. "We just hit 50,000 Facebook Followers! We wanted to thank everyone for being so awesome so we came up with a contest we thought everyone would be hyped on. Create your own SCS engraved design! 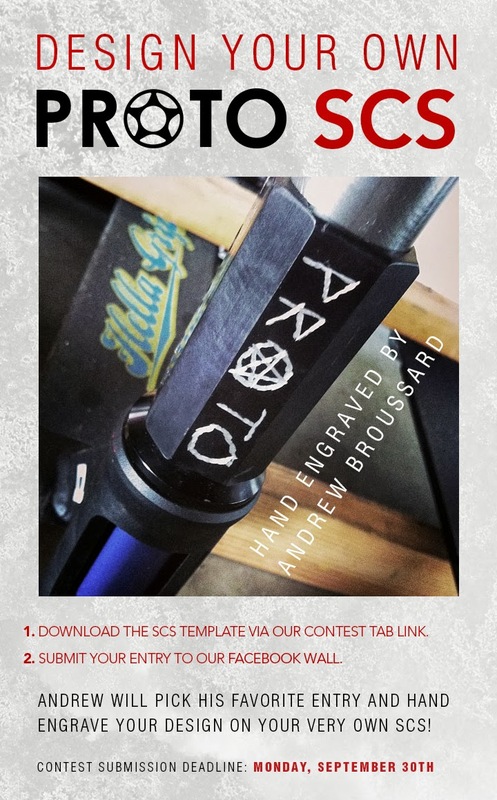 Winning design gets hand etched onto your own personalized SCS by Andrew Broussard! Get to designing!" Summer is the season for road trippin, filming, riding and having fun, and the Basic guys took full advantage of that fact. In addition to the usual Northeast locations, David and Ben took a trip to Chicago for the street jam and to film. They managed to get some awesome clips there, and so did the rest of the gang everywhere else. When you take Elliot Arnold, Cory Vanlew, Fedore Moore, and Manny Vargas together, and then stick Max Manning in there to film and edit all the footage.. You end up with a beast edit. All these dudes hold it down with plenty of style in all of their clips. It's a lengthy video (though it does end after the 10 min mark), if you didn't already get that from the name. But it's well worth it. Check it out. You'd probably recognize Kilean for his flatland videos (another one of which is in the works, by the way), but he can also get down in the streets. This video for Gryndo shows that. His manual/tech combo skills are enjoyable both on spots and on flat. Zig Short's latest musical endeavor takes form as a music video for his track "The Art of Stuntin," and it is dope. This is the best thing you'll see all week. My favorite shot is 1:10- scoot scoot, bang bang. Produced by Donell Cooper Jr.
Tommy has been a killer rider for a long time now, and District recognized that and has added him to their Team. Tommy is one of those dudes who seemingly has no weakness in his game. Flat, Tech, Park, Street. I just love watching this kid ride. Stoked that he is on a legit Team now, hope he gets to travel and expand his riding even more. For as long as I can remember, Phoenix has been one of the few companies that manufactured all of their products in the USA. However, when 90% of all other companies are going to China, making cheaper parts not only in price, but some, in quality as well, you as a company have to act. Phoenix has done just that, by starting SESSION by Phoenix. For more information check out the press release, and the interview with Phoenix founder, Tom Floyd. A: From the beginning, when I started Phoenix, I have always been dedicated to providing riders with the best decks and parts I could make. I want riders to be able to trust our products and push themselves and the limits of the sport. As the sport has matured, we have found our retail pricing to be out of reach for most riders. The reason for starting this new brand is to make our products more affordable. A: I have always been dedicated to manufacturing here in the USA. However, with high manufacturing costs and long lead times, we have not had the ability to lower our retail prices. It has literally forced us to hold our pricing higher due to those costs. 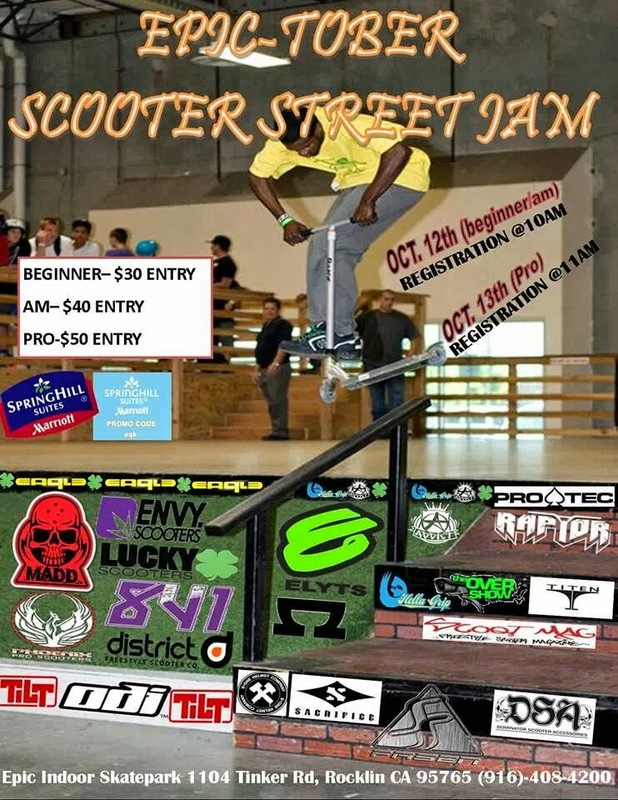 As the scooter scene developed and more riders have come into the sport, Phoenix became an “Aspirational Brand”. We have done ok in America, but internationally, we have never been able to offer big enough discounts to keep our retail prices within reach of the riders in foreign countries. For that reason, our team has decided to make the SESSION by Phoenix line in China. A: Yes. All the parts in the line are still designed here at the Phoenix factory with our riders input as well as our years of design and engineering experience. We are not simply choosing our new parts out of some catalog as others have done. For example; The SESSION deck was designed by Evan Larson and myself and has been tested and produced here in the USA before taking the manufacturing overseas. Any parts we decided to make were carefully considered for the cost savings and no compromises were made in material selection or manufacturing techniques. In fact, our lead welder and myself went over and spent a week in the factory training workers in our welding and production methods. A: I have personally struggled with this and at the end of the day I am ok with what we are doing because it allows us to continue to employ riders like Evan Larson, Cooper Klaar, Dan Barrett and Chase Robertson, all of whom I met through scootering. My loyalty IS to my riders, employees and their families. Phoenix is an American company, plain and simple. My job is to grow our business and protect our employees’ jobs. Everything we are doing ensures that our employees and our Pro Riders will continue to get a paycheck. A: These are 100% Phoenix designs which have engineering, material specifications, heat treating methods and production procedures carefully spelled out. Additionally, we have a production manager in place who works at the factory every day to oversee that those standards are being met. Each and every component has been submitted for testing and cannot be produced until our riders sign off on the control sample. 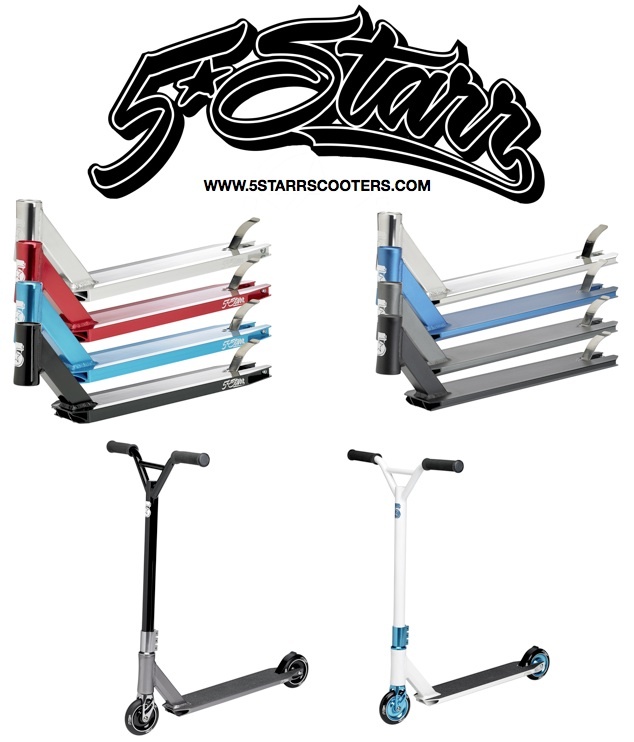 A: We will still be making an exclusive range of decks and bars here in the US under the Phoenix Pro Scooters name. Reventon decks and SV2 bars will still be made in our shop and our new Reventon V2 is in the planning stages and our riders sig models are underway. I felt it was important to create a new brand to preserve the prestige of the American Made product. Of course, it will also have the higher price tag as well. Q: So how does this move affect the sport? A: It allows us to grow our marketing budget and keep our team employed and travelling. Our riders have so many creative ideas for filming trips and places they want to see the sport exposed. We believe that our riders involvement in the scene is critical to keeping our brand message on point. Running a profitable, healthy business also allows us support more comps and events and provides the resources to send our team to those events on a more consistent basis. A: We have a new 4.25 complete at $249 and the new 4.5 complete at $349 US Retail. We will be offering the SESSION 4.5 as a deck only in 20” and 21” lengths and we have new wheels coming which the riders have already been testing and love. Also, we will have grips, headsets and griptape. The new SESSION by Phoenix product range will debut at the 2013 Interbike tradeshow in Las Vegas and be available for dealers in November in time for Christmas. Gryndo's Colorado boys, Ian Herncjar, Adam Cordova, and Andrew Cordova, recently filmed some clips at some local clips. Ian's clips are always wild (follow him on instagram @ianherncjar for more ridiculousness) and Adam's style is so gangster. This is some footage of Kota filmed by Aaron Hill...it should fulfill your daily recommended dose of ninja scooter chucking skills. Any footage of this guy just blows my mind. Holdin It Down For P-Town is a video that's been in the works for a while now. This is Heston Gross's part, and it's awesome. Evan is a great filmer and Heston is a super dialed, clean rider. I'm stoked this video is finally coming out, can't wait for Evan's section. The MGP Team is stacked full of park riders, so it's a good to see a rider like Jordie who can get down in the streets, and hold it down with his ridiculous peg tricks. Wallride to flair was so good. Song choice though... I dunno man..
New 5Starr Scooters Products, Decks and Completes! 5Starr got off on the right foot by doing a few things.. One was not shoving themselves in everyone's faces as soon as they popped up. They played it smart. Put together a sick team of up and coming talent. And even had Olivia Monks come out from Florida to Cali to film and edit up a Team video. Now they're dropping what most people have been waiting for, which is their decks. Two kinds of decks, and completes. To check em out see the promo below. The Phoenix boys made this little video documenting a chill day for them. We get to see a little bit of the daily routine as well as some fun riding. Diggin the song as too. This is also the first video on the Lavish Scootering channel. Not sure what Lavish is about but I'm looking forward to seeing more. It doesn't even feel like it's been that long since the last James Gee video, but the Lucky OG is back again with a video in HD. James hits a ton of rails in this edit, as and has a lot of clean, dialed lines. Front feeb whip front feeb truck was fire. I don't know if you guys have ever made it out to one of the SZ Am Jams that they throw every year, but I have, and it was awesome. Tons of pro riders throw down for the Best Trick contest, and you get to see some of the sports top Amateur talent kill it in a competition made just for them. 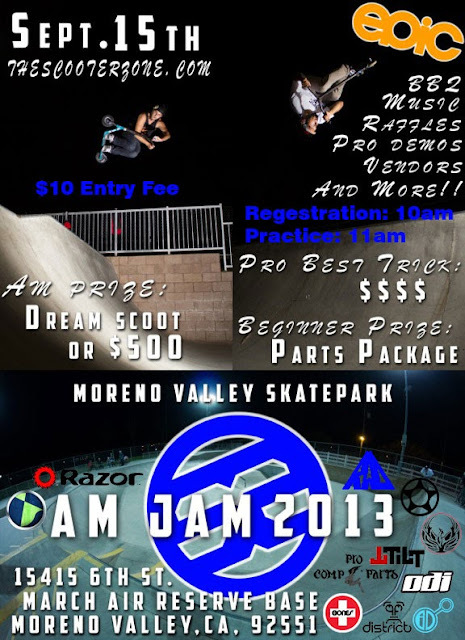 Head out there this weekend and support the Am Jam. There will be vendors, bbq, music, raffles, and more. So don't miss out. For more information check the poster. Tyler Wheeland might not be regarded by most as one of the top riders in the sport, but he is full of talent. Yeah you see him in the streets now a days, more than often riding on walls, as opposed to the ground. But he can still shred parks up with no problem. This edit was filmed when Tyler was 17, by his buddy Stephen Diaz, who did a hell of a job. It's one of my favorite edits not because of the riding, but because of what the video stands for. Check it out. Wow, Jake rides that thing like its a normal scooter. Envy's entry into the dirt scooter field, the ATS, seems to be a little more trick-friendly (lighter) than Phase 2's. Or maybe Jake is just that good. Either way, this is some gnarly footage. Brendon is at it again. This time mixing it up with some street clips in there. Brendon in the past got a lot of hate for his videos seeming to repetitive, so I was feeling the mix of different clips in here. Not sure if I prefer his street clips over his park clips though. As long as he mixes it up with his park clips, and they're not all quarter clips, I'm good. Some crazy stuff in here though for sure. This is a full-length by a group of guys from Pittsburgh, Pennsylvania. It's so rad to see little crews like this doing real things despite being relatively far away from bigger scooter scenes. Floridian Michael Hohmann is also in this, you definitely don't want to miss his part. While this video might lack in production value, the overall effect is awesome. Props to these guys for getting this done. Next Satori promo to drop came from Jordan Jasa. You know those riders that you sit around waiting impatiently for them to drop new clips? In my opinion Jordan is one of those guys. Stoked that he is a part of Satori, and word on the street is they will be having a full length video featuring all of the guys in the future. There is a fakie feeble to 360 heel in here, so yeah. Started from the driveway, now he's here. Kenny was just put on Urban Artt. Known mostly for hucking it at the Dissidence Street jams (7:55), it'll be interesting to see how his riding progresses now that he's on a legit team. I think it's safe to say that he has the biggest truck and 360 whip ever done on film. I don't know if I've ever heard of this guy before which is a bummer because he is rad. Such raw, OG style. All the Long Beach street clips were so sick. Editing was pretty crazy too. The Anaquda boys were in Seattle for the street jam, and were able to film this whole video in just a few days. Unfortunately Josh Brown got injured as you can see in the first clip, but he was still able to come through with some clips before he fell. Good stuff. First of all, no it's not the full Stefan Hefner video, so don't get your hopes up like I did. But it does have some footage of him, and the rest of the Source guys. If you don't know, Source is a little company Stefan is starting. The team consists of a few newer names and some who've been around a while. The list includes: Stefan Hefner, Jack Colston, Matt Grippi, Maverick Knight, Efrain Arriaga, and Alex Espinoza. All of them have sick clips, so give this a watch. It's unfair how good Reece Jones is. Makes everything look so effortless. Love the vibe from this video- good riding, good park, everyone getting gnar. Looks like a good time for sure. Jon decided it would be a good idea to 360 whip off a 13 foot drop at the Seattle Street Jam. He landed it clean second go and walked away with 2nd place for best trick, props to him. Hopefully an official street jam video will be out soon. UK native Danny Roberts has been filming lately, and this is all new stuff he just released. The feeble 180 fakie half cab downside fingerwhip was so cool. Plenty of dope lines, and clean riding all around. Even for throwaway Dom had some decent stuff in here. I don't know about you guys, but that rail in the beginning looks intense, and it looks like it got the best of Dom on that attempt. Guess we'll have to wait for the DVD to see if he ever slayed that beast. Hep Greg, KC Corning, Travis House, and even the Thom Cat are featured in this video from TSI. Some really steezy shredding from everyone. Greg's pocket air downside whip was one of the coolest things I've seen in a minute. Never before in this history of scootering has a scooter cheque of this magnitude been filmed...why do I say that? Watch and find out. Zach is part of the "Trendy" crew from SD and he kills it. Lots of gnarly stuff in here. Best clip was at 4:15, shoulda been his ender! Don't get me wrong though, the ender was super dope too. Hyped on this edit. Enzo is a total beast. He recently made a promo for the new 841 5 Star wheels, and I have to admit they look really good. Loving the mix of park and street from Enzo. Think I'm digging his park clips more though. Check it out below.